In 2012 the branch became involved in the South Downs Way Ahead project, focussing on chalk grassland restoration in the Winchester area. This was part of a wider NIA (Nature Improvement Area) project that attracted government funding to improve the quality, extent and connectivity of chalk grassland habitat along the South Downs. Working in partnership with local conservation organisations we engaged with landowners to join up chalk grassland sites across the landscape, providing ideal habitat for priority butterflies: Small Blue, Duke of Burgundy, Grizzled Skipper and Dingy Skipper. Read more in the case study by South Downs National Park Authority - ‘Chalk Grassland Restoration – Winchester Focal Area’. Click here to download the case study. For information on the project work and achievements in the Sussex Branch see the report by Neil Hulme ‘Monitoring and Evaluation of the South Downs Way Ahead NIA Project in Sussex’. Click here to download the report. Our understanding of how species persist within dynamic and often highly fragmented landscapes has increased dramatically in recent years. Many early conservation efforts focused on conserving particular species in particular habitats but the emphasis today has moved to the conservation and management of habitats for a range of species across large natural areas. These areas frequently consist of networks of different habitat types (such as chalk grassland, woodland and heath) across a range of topographical features (such as hills and river valleys) in both rural and semi-urban contexts. To promote best practice woodland management at a landscape-scale for a broad suite of wildlife including butterflies and moths. To target specialised habitat management for key species such as Pearl-bordered Fritillary and the Duke of Burgundy. To engage communities in conservation action in their local area. Butterflies associated with mature woodland stages such as Speckled Wood, White Admiral, Silver-washed Fritillary and Purple Hairstreak have done relatively well in recent years with overall population increases of 65&percnt; since 1985. These species are able to occupy the shadier conditions found in woods that are no longer subject to traditional management practices such as coppicing, laying and ride-widening. In contrast, species associated with short swards (e.g. Dingy Skipper and Grizzled Skipper) and herb-rich woodland rides (such as the Wood White) declined by 66&percnt; between 1985-2009 whilst specialist butterflies associated with open woodland glades and clearings fared worst of all with population declines of 80&percnt; since 1985 (Clarke et al., 2011). These species include some of our most threatened butterflies such as Pearl-bordered Fritillary, Small Pearl-bordered Fritillary and the Duke of Burgundy (now the target of its own landscape-scale conservation project, "Dukes on the Edge"). 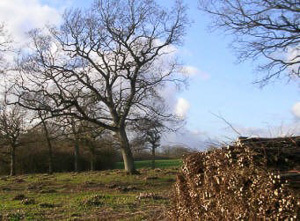 The "South-East Woodlands" project worked with partner organisations and landowners to demonstrate the value of targeted woodland management on a landscape-scale. A key goal was to increase the structural diversity of woodlands by creating mosaics of open clearings connected by wide rides alongside coppiced scrub of varying ages with mature woodland. Three landscape areas in Kent, East Sussex and Tytherley Woods on the Hampshire/Wiltshire border were the chosen demonstration areas. This rural landscape covers 17,400Ha and comprises a mosaic of semi-natural habitats including ancient semi-natural broadleaf woodland, unimproved chalk downland and the neutral meadows of the Test Valley. 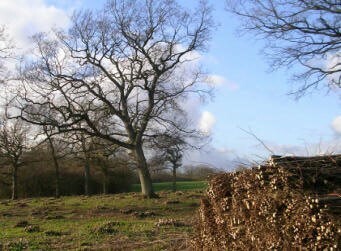 Arable farming has shaped much of the open character of the area but it is punctuated by extensive patches of woodland, the remnants of a much larger forest. Sixteen habitat patches were created for Pearl-bordered Fritillary with the support of a SITA Trust grant in 2007-8. All the patches produced suitable breeding habitat within 4 years and 75&percnt; of them were colonised by the butterfly over the same period. Duke of Burgundy, Small Pearl-bordered Fritillary, Dingy Skipper and the BAP-priority moth, Argent and Sable, were also recorded on these patches. Pearl-bordered Fritillary also re-colonised seven former sites in the Tytherley landscape in this period, travelling at least 2km from the nearest colony to breed in newly managed clearings and rides. The work at Tytherley Woods demonstrates that populations of threatened species can respond rapidly to appropriate management where it provides networks of suitable habitat at a sufficient scale. In particular, targeted management at unoccupied sites within the known dispersal range of established colonies can pay particularly good dividends with only modest changes to the overall landscape (Hoare et al., 2012). A second and on-going example of the landscape-scale approach to conservation is the South Downs Way Ahead Nature Improvement Area with which Butterfly Conservation is actively involved, particularly in the area around its Magdalen Hill Down reserve. Click here for more information. Clarke, S., Green, D., Bourn, N., &amp; Hoare, D. (2011). Woodland management for butterflies and moths: a best practice guide. Butterfly Conservation, Wareham. Hoare, D., Dent, K., Kelly, C., McLennan, L., Thompson, F., &amp; Wheatley, S. (2012). Landscape-scale woodland restoration for multiple species in the South East Woodlands. In S. Ellis, N. Bourn &amp; C. Bulman (Eds. ), Landscape-scale conservation for butterflies and moths: lessons from the UK (pp. 66-75). Butterfly Conservation, Wareham. 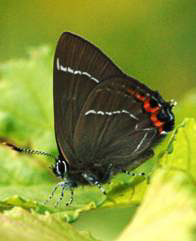 The White-letter Hairstreak is surely unique among the nation's rare and endangered butterflies. 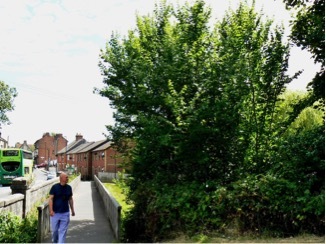 As a habitat-generalist, it is as much at home on a clump of elm behind a Gosport petrol station as in the wider countryside. Thus the overriding factor in its distribution and numbers is simply the availability of its sole host plant: sexually mature elm. All the elms native to Europe are known to host the butterfly, but they are also highly susceptible to Dutch elm disease (DED) if infected. As a consequence, the butterfly has declined drastically; from 1984 to 2009 in England & Wales alone, its numbers fell by 98&percnt; (data from the Centre for Ecology & Hydrology). The butterfly is now on the IUCN Red List as 'in imminent danger of extinction'. However the White-letter Hairstreak is also almost certainly under-recorded owing to its indolent nature, preferring to bask atop the trees until disturbed. An infrequent visitor to flowers such as thistle and bramble, it is rarely seen by the casual observer, and sightings usually require teamwork. With one or two individuals to shake or bombard the branches to put up the butterfly, others look on using binoculars, with luck able to follow its rapid, zany flight to its next perch, where its definitive underwing may be studied at leisure. The butterfly lays its eggs in July, usually on the girdle scars separating the previous year's growth from the current. The eggs hatch the following March, several weeks ahead of the flushing of the leaves. On emergence, the caterpillars scurry to the nearest elm flower within which, almost invisible, they will feed before progressing to the seeds, and ultimately the leaves. Ergo: the sexual maturity of the elm is critical. The obvious means of conserving of the butterfly is to plant elm cultivars highly resistant to DED, and also the European White Elm Ulmus laevis, an anomaly rarely infected with DED simply because the vector Scolytus bark beetles find it distasteful. A full review of suitable trees, with a list of suppliers, can be found in this elm report. The White-letter Hairstreak, like all butterflies, is a 'creature of the sun' and therefore elms should be planted in open, sunlit, but preferably sheltered, locations even though the elm itself is largely shade-tolerant. Mr. Andrew Brookes has now published an update on the Elm Cultivar Trials. This new report covers 13 cultivars providing details on their development performance and suitabilty for growing in various environments. Click here to access the latest (6th) report. 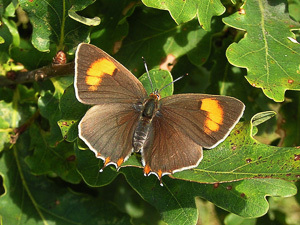 During summer 2012 a new single-species transect route was set up by Andy Barker, to monitor Brown Hairstreak numbers over its relatively short flight period, of around six weeks. 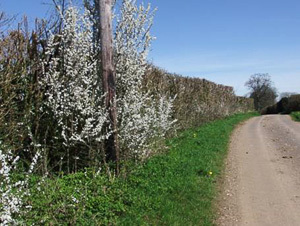 The colony is based on land west of Shipton Bellinger, where the habitat comprises plenty of broad, mixed-species hedgerows of high blackthorn content, with patches of woodland and mature scrub. Several well grown ash trees rise above the hedges and scrub, offering the most reliable chance to see the species, although adults can be sometimes be found lower down nectaring on creeping thistle or taking the juice from over-ripe berries of the wayfaring tree; the latter seems to be a speciality of this site. Several particular ash trees appear to be used as assembly areas, where the activities of basking and feeding on aphid honeydew take place, while the males hope to encounter an unmated female. These variable habits of the species mean that there are many areas to look, both high and low, when walking the transect route. In national terms, the Brown Hairstreak is a fairly scarce UK BAP listed butterfly whose 10 year population trend has declined by 40&percnt;*. In Hampshire and the Isle of Wight it is only recorded reliably at two locations, the other being the Noar Hill area near Selborne, where numbers have become perilously low. It was therefore agreed that it was important to apply a formal recording scheme to monitor the fortunes of the species at this site (now the strongest site county wise), rather than relying on ad hoc casual records. Given sympathetic management, as here, of hedgerows and scrub over a landscape scale, this species can maintain its foothold, or even expand its range. This appears to be happening with the colonies north-east of Oxford, with a genuine increase in numbers and range expansion over the period 2001 - 2010, vs the period 1990 - 1999. The life cycle and ecology of the Brown Hairstreak are described in an article by Clive Wood available in the Member's only section of the website. In order to give a good chance of recording the species, the transect covers a longer than average route of circa. 3km, which is divided into 10 sections. The key period covered is late July to mid. September, representing weeks 18 to 24 on a full season transect. Peak counts were of up to 5 individuals per weekly visit, producing an Annual Index of 23. This transect will therefore be supplying data that is valuable in both a regional and a national context, for this under-recorded high priority species. Positive or negative changes in the local land management, i.e. of the hedgerows, scrub and mature trees are likely to be reflected in the transect totals recorded, together with the unknown future impact of the Ash fungal disease Chalara fraxinia. Andrew Bolton Conservation Sub-Committee November 2012. 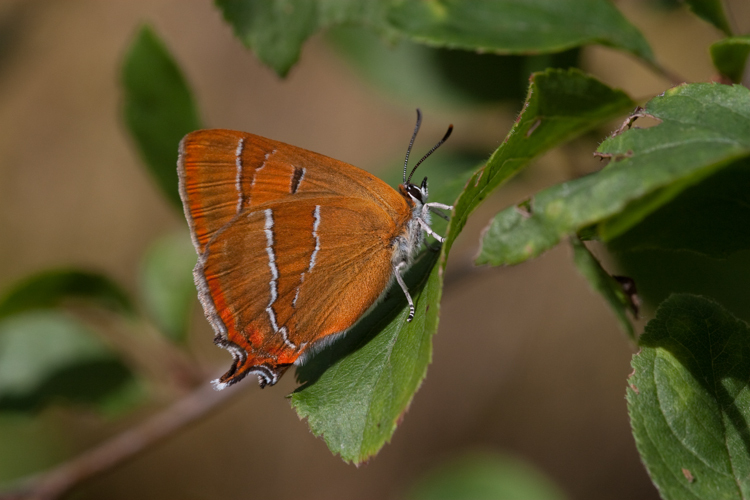 The Brown Hairstreak (Thecla betulae) was once a common sight amongst the hedgerows and woodland edges of Hampshire in late summer. It is now found in only three isolated populations in the county and has declined nationally to become one of our rarest butterflies. The good news is that Selborne is a relative stronghold for the species and things may be looking up for this beautiful butterfly. Brown Hairstreaks lay their eggs on young blackthorn twigs between late August and early September. The eggs are extremely vulnerable to any type of hedge-trimming before they hatch in late April onwards the following year. A severe trim can destroy an entire colony. The past few years have seen a great deal of work take place around Selborne to improve the countryside for Brown Hairstreaks. South Downs National Park staff have paid advisory visits to local farmers and many now cut their hedgerows every two to three years on rotation, rather than annually, and trim less severely. 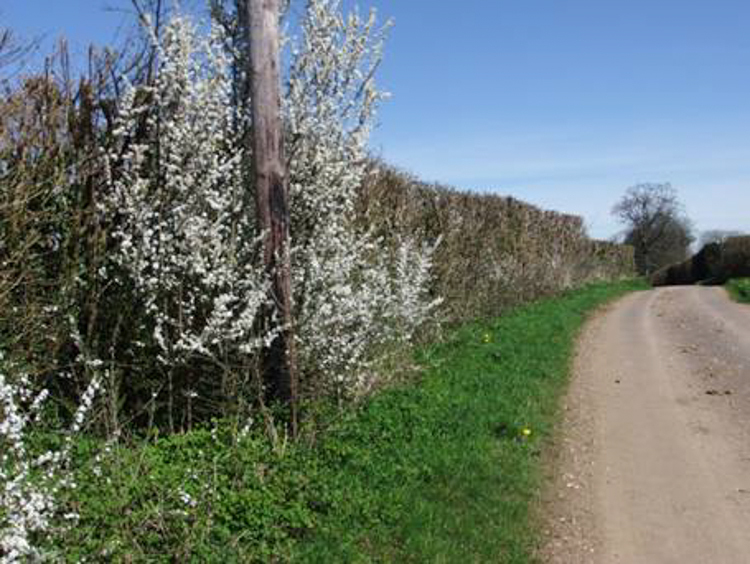 Local landowners have also planted over 750m of new blackthorn-rich hedgerow with practical and financial help from the Hampshire and IoW branch of Butterfly Conservation. This work appears to be bearing fruit, and not just new blackthorn sloes. 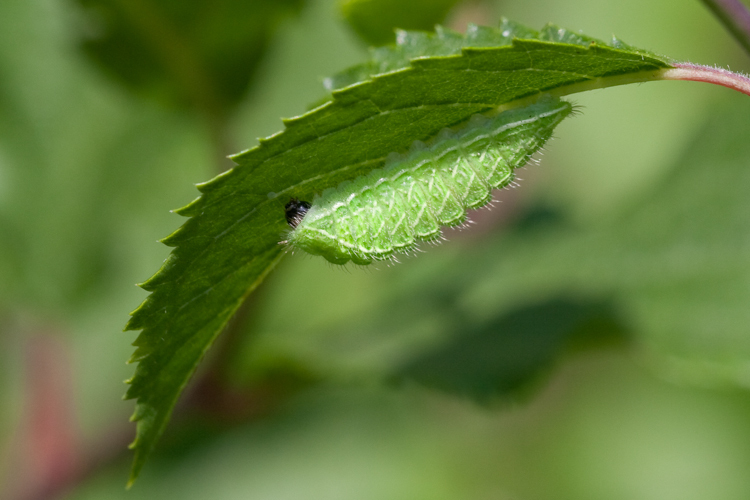 In February this year, members of the Hampshire and IoW BC Conservation Committee organised a Brown Hairstreak egg survey of 66 hedgerows in the farmed land between Noar Hill and Selborne Common. The survey team included BC and National Trust staff, a local resident and volunteers. The survey found over twice as many eggs as an identical survey in 2009. The hedgerows around Charity Farm and Lower Noar Hill Farm were particular hotspots. Although not conclusive, the results suggest that the butterfly is finding better quality egg-laying habitat in the area between the established colonies on Noar Hill and Selborne Common. Female Brown Hairstreaks are good fliers and healthy, blackthorn-rich hedgerows should help the species to broaden its distribution in the area and connect populations. The survey will be repeated in 2014 working with the National Trust and the SDNPA. For more information on the survey or how you can help, please contact Clive Wood (clivepwood AT btinternet.com). This is a Butterfly Conservation, Hampshire and Isle of Wight branch internal report and is not for commercial use. If people wish to refer to the document the citation is: "Jeffreys, P. &amp; Barker, A. (2011, September). Magdalen Hill Down Extension: Review of botanical trends (1998 - 2010) and assessment of likely impact on selected butterfly species. Unpublished internal document, Hampshire and Isle of Wight Butterfly Conservation". Click here to download the document. Dr. Andrew Barker has forwarded 2 documents with data on the disease and managing suspected outbreaks: Defra - Chalara Key Scientific Facts, and Forestry Commission - Chalara &amp; managing ash trees.